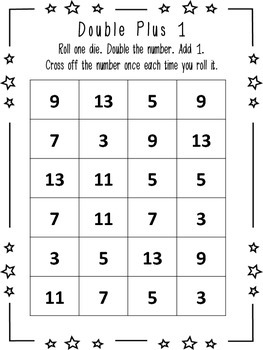 Students can practice adding with this fun and easy game. When students roll one die they double the number and then add one to the sum. They cross off their number as they roll trying to cross off all numbers from their board. There are three boards here. One has numbers for a regular die (1-6). 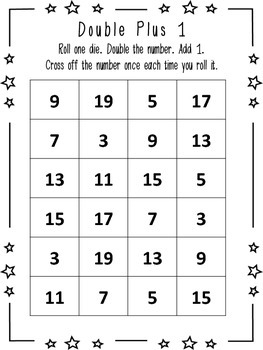 One has numbers up to the double of nine and the last has double of up to 12 for math specific dice. I print these boards on cardstock, stick them in a page protector and have students mark off their numbers with a dry erase marker. They make a great addition to math centers and work stations.